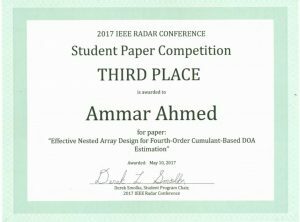 Mr. Ammar Ahmed, a PhD student at the Advanced Signal Processing (ASP) Lab of the Department of Electrical and Computer Engineering, Temple University, won the third prize Best Student Paper Award at the 2017 IEEE International Radar Conference held in Seattle, WA in May 2017. 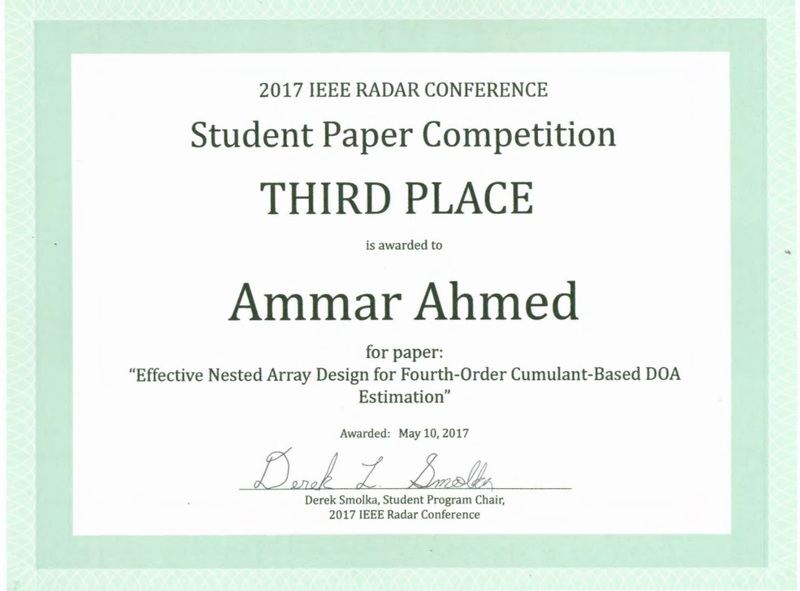 Titled “Effective nested array design for fourth-order cumulant-based DOA estimation,” this award-winning paper develops new design strategies for sparse nested arrays that perform direction-of-arrival (DOA) estimation using fourth-order comulant. Co-authors for the paper include Ammar’s advisor, Dr. Yimin D. Zhang, and Dr. Braham Himed, technical advisor of the RF Technology Branch, Air Force Research Laboratory (AFRL). This research is sponsored by a contract from the AFRL and a grant from the Office of Naval Research (ONR) that support Dr. Zhang’s research activities. In the 2015 version of this conference, Dr. Saurav Subedi, then Ph.D. student at Villanova University working with Dr. Zhang, received the second prize of the Best Student Paper Award. The IEEE International Radar Conference, organized by the IEEE Aerospace and Electronic Systems Society, is the IEEE’s flagship conference on radar. Among the 334 accepted papers, five were selected as finalists and presented in the competition. A judging committee of renowned experts from both academia and industry selected three awardees based on factors including novelty, originality and contribution to the area, technical correctness and accuracy, and importance or significance of the results. As the third prize student winner, Ammar received a certificate and a cash prize of $500.